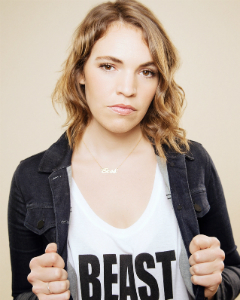 Beth Stelling is a stand-up comedian, writer and actress based in Los Angeles, who Time Out Magazine names a Comic to Watch in 2016. Beth made her late night television debut on Conan. In 2014, Beth appeared on @Midnight, Chelsea Lately, and The Pete Holmes Show. She most recently performed stand-up on Jimmy Kimmel Live, after Jimmy saw her at UCB and approached her personally. Beth tours extensively, performing at festivals, colleges, and clubs across the country. Recent notable TV appearances include Showtime’s SXSW Special, Last Call with Carson Daly, and The Meltdown with Jonah and Kumail. In October 2015, Beth’s Comedy Central ½-Hour Special debuted – Vulture included it as one of the “Ten Best Stand-up Specials of 2015.” Beth’s 2nd album, Simply the Beth debuted simultaneously which debuted at #3 on the iTunes Comedy Charts. Beth is currently writing on the HBO series, CRASHING. © ℗ 2013 The Comedy MIX. All Rights Reserved.